“Please can you help me by identifying this centipede? It was found in my compost heap and is actually paler than in the photo (01), all silver. “The consensus so far is that it is an immature Henia vesuviana. Adults are more or less transparent greyish with the grey green cells covering the gut and showing through . Also the white longitudinal dorsal vessel. See picture on front of Aidgap Centipede Key. 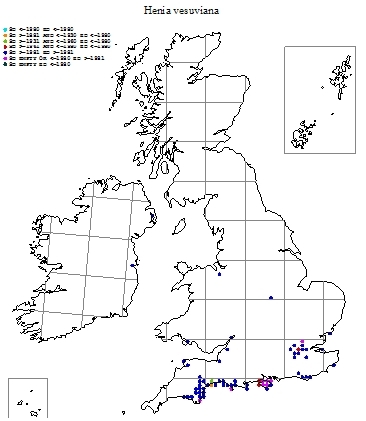 Quite a lot of records from the South Coast and scattered in synanthropic sites also. Most northerly in England is indoors in Lancashire”. He also sent a map (02) of the national distribution and a picture of the centipede (03). Impasse! The experts disagree. Unfortunately our efforts to contact the finder have so far failed. We hoped he would go foraging in his compost heap and find us a specimen to identify. On checking the key against the picture it is impossible to confirm the centipede’s identify without a specimen as some distinguishing features can only be seen with a microscope. Easily seen diagnostic features of H. vesuviana are listed in the key and these include both ends of the adult animal being light reddish brown; greenish grey body contents seen through the transparent skin; and a distinct white line along the dorsum which is actually a blood vessel. 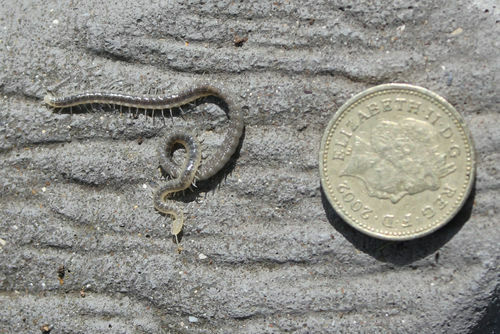 Reg Hawkins’ centipede shows the last two features but is pale at both ends hence the suggestion that it is a juvenile (the picture on page 94 of the key shows both ends pale). Characteristically H. vesuviana curls up into a ball in soil with the glandular underparts outward. These produce a sticky secretion so the posture is probably defensive. 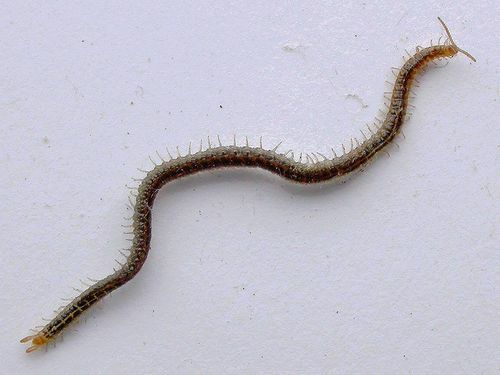 We cannot be sure of the identity of the is centipede but it is certainly unlike other Geophilomorpha commonly found in gardens and wiidlands. The true habitat of H. vesuviana is coastal with odd records inland usually associated with human habitations and activities (synanthropic). These animals have probably been transported inland by people or goods moved from coastal places. Barber, A.D. 2008. Key to the identification of British centipedes. Field Studies Council AIDGAP key. 01. Reg Hawkins' picture of unidentified centipede. 02. Henia vesuviana national distribution map. A D Barber.